Dicksons of Perth is dedicated to our after sales and customer service, and unlike many other companies we put our customers first. Our ongoing services provide an affordable solution to ensure your caravan or motorhomes maintenance is how it should be to keep you on the road, the regular servicing of your caravan or motorhome will pay off in the long run with greater reliability and improved resale value. 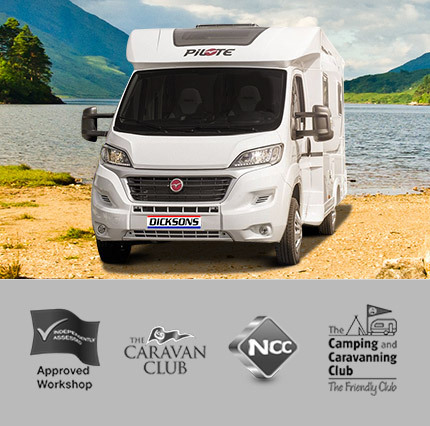 We have an excellent team of fully trained vehicle mechanics and habitation engineers that will take care of your beloved motorhome, and as we are part of the NCC Approved Workshop scheme we follow the correct procedures when working on your caravan or motorhome. We also offer a great range of optional extras, including awnings, bike racks and tow-bars, to ensure your caravan or motorhome meets your required needs. Should you have an accident whilst out on the road with your caravan or motorhome, don’t worry as we can carry out both bodywork & paintwork repairs following the correct manufacturers repair procedures. At an extra cost we can even offer you one of our hire motorhomes to keep you mobile whilst the repairs are being carried out to your caravan or motorhome. Prior to any vehicle maintenance we would ask that all customers please ensure that their valuable personal belongings are removed from the motorhome & any non- valuable items are stowed away correctly, this is to prevent any damage that may occur to them while we are on a road-test. Prior to any habitation area servicing on both caravans & motorhomes we would ask that all personal belongings that are stowed away under beds, in cupboards, etc. are removed to allow our technicians greater access to these areas to ensure we carry out the required checks. Regular servicing of your caravan or motorhome will pay off in the long run with greater reliability and improved resale value. But there are safety and legal issues too. Every vehicle or trailer is required by law to be in such a condition as not to cause danger to anyone. Some items you can easily check for yourself, such as tyres and lights, but the braking system and the electrical and gas items inside the habitation area are best left to experts if you are not to risk your safety or that of others. Many people have never encountered the term "Motorhome Habitation Service" before, also called a habitation test. Just think of a motorhome habitation service as being the motorhome equivalent of an MOT. We help check and maintain the functionality of all aspects of your motorhome that are used for living such as LPG, water and electricity. These items can be a safety issue if not checked periodically, and may also render your warranty invalid if not checked. Especially if the manufacturer has a list on the warranty which has a habitation service stipulated to be tested annually to ensure conditions are met. The actual service isn't mandatory in a legal fashion (at the moment), but it would be foolhardy to drive around in a motorhome or campervan that doesn't have its annual habitation service, due to the number of issues that could arise if not inspected. Electrical safety issues could arise which could prove dangerous, LPG leaks could occur that could prove dangerous (if not fatal), and water leaks could happen that could prove very expensive. So, you can see it's well worth the peace of mind if nothing else, to pay out annually for a check to detect or prevent any issues. A common thought process is that I don't use my motorhome or caravan very often so, it's not worth paying for the test this isn't the case as the lack of use itself can cause issues too. Dicksons of Perth are dedicated to carrying out any damp and insurance repair work. One of our friendly team will be in touch as soon as possible to arrange deposit. Alternatively, please do give us a call to discuss your requirements.